Increasingly I find myself creating Twitter hashtag archives using my TAGS Google Spreadsheet template as a means to identify who in that community has the most influence and ultimately use this intelligence to target people that might be able to help me disseminate my work. Marc Smith at the Social Media Research Foundation has a useful overview on ‘How to build a collection of influential followers in Twitter using social network analysis and NodeXL’. “betweenness centrality” – a measure of how much a person acts a bridge between others. To date the only way I could calculate BC on an archive of tweets was to download the data to my desktop, run it through NodeXL and review the data. This isn’t ideal as the data becomes orphaned. I have experimented with calculating BC using Google Apps Script using a modified version of some PHP code put together by Jonathan Cummings, but kept hitting timeouts before I could get anything back. I forgot about pursuing this angle until that is I saw Tony Hirst’s A Quick View Over a MASHe Google Spreadsheet Twitter Archive of UKGC12 Tweets in which he uses the statistical computing and graphing tool ‘R’ to read a spreadsheet of archived tweets and produce some quick summary views (I highly recommend you read this post and also check the contribution from Ben Marwick in the comments). Reading this post made me think if it is that easy to read and analyse data using R could you also not somehow push the results back. Fortunately, and I do mean fortunately, I have no experience of R, R Script, R Studio (I like having no preconceived ideas of what new tools can do – it far more rewarding to throw yourself into the unknown and see if you make it out the other side), but I do know a lot about Google Apps Script giving me a destination – just no way of getting there. The idea, I think, is ingeniously simple. Read data, as Tony did, process it in R and then using Apps Script’s feature to be published as a service to simply POST the data back to the original spreadsheet. As that is quite complicated I’ll recap. Fetch a Google Spreadsheet as a *.csv, do something with the data and then push the data back in the same way that you post a web form (and if you skipped the link the first time POST the data back to the original spreadsheet). Having sunk a day of my own time (and it is my own time because I get paid for the OER Visualisation project for the hours I work on it), I’m not going to go into the details of how to setup R (or in my case RStudio) to do this – hey I learned it in a couple of hours so can you – instead I’ll give you the bits and pieces you need and general instructions. 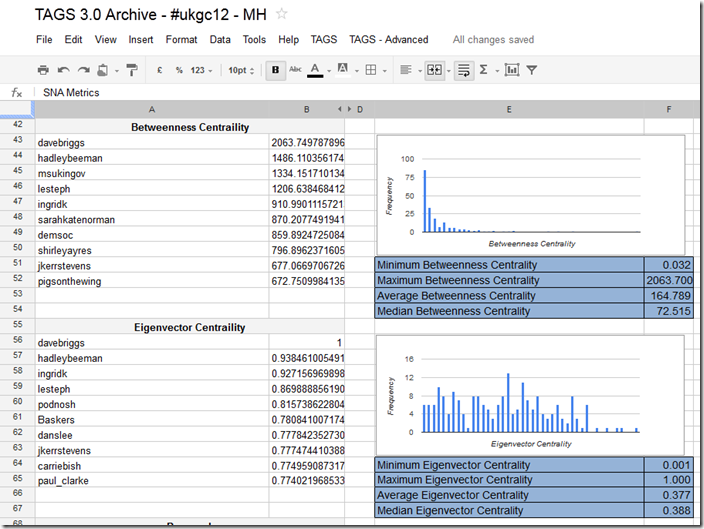 Before I start you might want to see if the result is worth it so here’s a sheet of SNA stats for the #ukgc12 archive. To make it easier I start with a partially complete dataset. The scenario is I’ve got my archive and run options 1-3 in the TAGS – Advanced menu to get an Edges sheet of friend/follower information. Open this Google Spreadsheet and File > Make a copy (this is a fully functioning – if I haven’t broken it of the next version of TAGS so if you clear the Archive and setup you can start collecting and using this with your own data). Back in the script editor on line 57 enter a ‘secret’ – this will prevent anyone from uploading data will in anonymous mode (you can choose to only enable the service when required for extra security. Open your install of R and load a copy of this script. I’ve commented most of it so you can see what is happening. While Apps Script has a debugger which lets you monitor execution and variables it can’t intercept the POST so I used the original POST/GET code to dump the data into some cells then tweaked the script to read it from there to work out what needed to be done. I think this is a powerful model of reading selected, processing and then uploading data back to the source. I’m also only using the very basics of igraph and sure much more could be done to detect neighbourhoods, clusters and more. Also I wonder if more of the friendship data collection could be done in R with the TwitteR – (you R people really know how to make it hard to find info/help/support for your stuff ;) Right now I can get friend/follower info for a list of 250 users. The intriguing aspect is just how much data can you push back to Apps Script and as there is a long list of Services could you also handle binary data like chart images (perhaps down the Blob and then Document Service route, or maybe just straight into Charts). That is just magic:-) So it gets me wondering: 1) R (and RStudio) can both run as a service (see, eg, cloudst.at). So I wonder, could an R script on a sever be configured with a webhook so that it could offer a URL endpoint for an R script, accept a call and chunk of data from a Google Apps script, process the result, and then post the result back to the spreadsheet?! So use R as a remote procedure?! 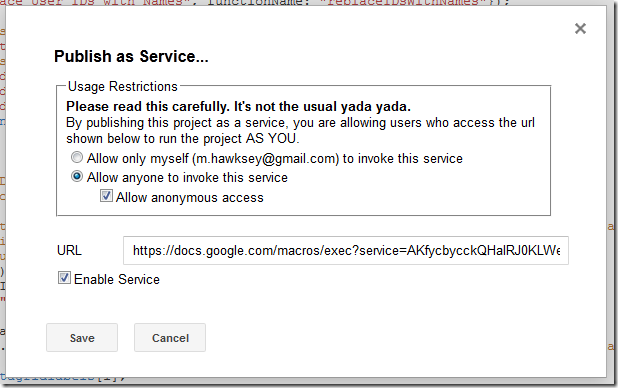 Martin – I may be missing something here but I keep getting an error message in R about unsupported URL scheme, followed all the steps and can tell the spreadsheet is outputting as the key works in the tagsexplorer on your site. Such a great tool but just feeling my way around a bit! Hi Glyn – which line is throwing the error?